Neutral color palettes like white, tan and beige have long-held their top spots as the most popular kitchen hues. However, the use of sleek, sophisticated grey color schemes is soaring. When it comes to kitchen design, grey is making its mark as the new must have essential color. Grey is both modern and edgy while remaining timeless and classic. So it comes as no surprise that grey is quickly becoming the contemporary neutral of our time. As a refreshing take on neutral, grey can be the perfect choice because of its almost chameleon-like quality, and its wide range of warm and cool shades. It suits just about every room, every mood, and every setting. The versatility of grey makes it perfectly suited for kitchens. It provides a relaxing neutrality and an exciting warmth to your space, giving you the best of both worlds. Grey presents itself as a fitting backdrop to any style from classic to modern and even transitional. All furniture styles and all ranges of bright colors pair delightfully with this modern neutral. Unlike beige and tan, it contrasts well with wood tones, making it the ideal companion for wood floors. Grey is calm and soothing, and despite being equated with rainy days, in the home grey is the opposite of dreary. A kitchen adorned with grey cabinets, and the right matching colors, is far from dull but rather inviting! You will find that grey allows other elements of the kitchen décor to stand out. Rich, vibrant colors or darker hues will pop when styled with all tones of grey. It is said that the grey color is a projection of attributes such as cool, wise, knowledgeable, quiet, peaceful and clean. 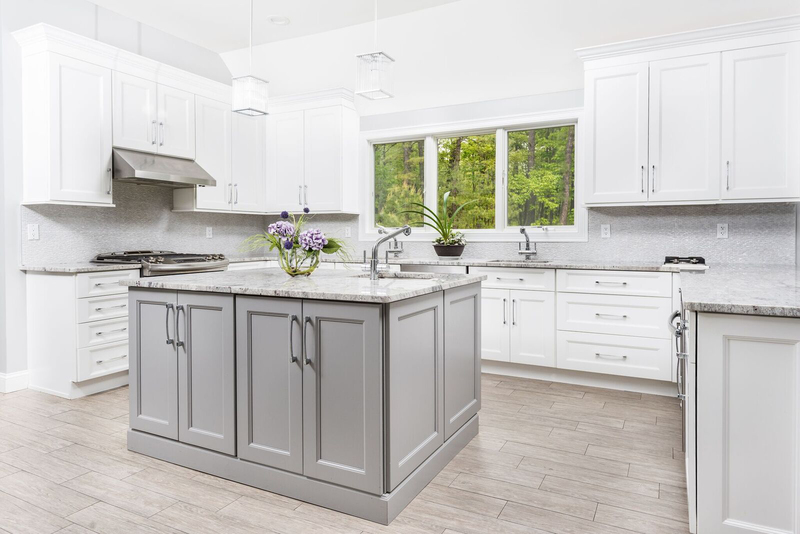 So it only makes sense that we encourage the use of grey cabinets to transform your kitchen into a place of tranquility, warmth and relaxation. What more would you want for the most important space in your home? For a home with small children, grey cabinets can be a bit more forgiving than the popular white choice. Grey is a perfect color to hide messes and unsightly imperfections and will help master a clean environment. To truly experience the magic of grey in the kitchen, opt for grey cabinetry. Painted, stained, or grey washed, grey is the perfect selection to be combined with other woods or white painted cabinets. Here are some versatile considerations that can help you achieve the look you are after. Light Grey cabinets: A pale grey color offers a crisp, clean look. Lighter shades are said to have a more feminine feel, and reflect a softer atmosphere. We suggest using our newly released galaxy horizon or nexus slate cabinets to capture the trend, and create a warm luminous feel. Dark Grey cabinets: For something a bit more dramatic, dark grey has a stronger more masculine effect. We suggest going with the galaxy cobblestone cabinets for a striking, climactic feel in your kitchen. Pairing different shades of grey will help complete a room that is both edgy and elegant. Grey is the perfect complement to white. It is important to point out that all the cabinets in your kitchen don't have to be the same color. You can mix and match by having the wall cabinets differ from the island cabinets. Pair several shades of grey together to achieve a more complex, layered effect. There is a shade of grey certain to please everyone’s palate. Whether your style is classic, eclectic, modern, traditional or transitional there’s a shade of grey just right for you.